Soy sauce fermentation under controlled temperature is a way to shorten the fermentation time. An energy-saving fermentation system was developed to power a heat pump for maintaining the temperature of sauce moromi at 37±1°C during fermentation. The chemical properties of the sauce moromi and the sensory properties of the soy sauce produced using the controlled fermentation system were evaluated and compared to those of the sauce moromi fermented outdoors without temperature control. The sauce moromi processed using the controlled fermentation system had significantly higher total nitrogen, formal nitrogen, amino nitrogen, reducing sugar and organic acid contents than the moromi fermented outdoor. However, no significant difference was found in overall liking score between two soy sauces. The soy sauce fermented under the control temperature showed higher Brix and salt concentration, but lower pH value than the sauce fermented outdoor. It was possible that the beneficial effects of reducing sugar and organic acid contents were rebuffed by the disadvantage of salt concentration. It was concluded that a controlled fermentation environment deserves the potential to produce a high quality soy sauce. D. Fukushima, “Soy proteins for foods centering around soy sauce and tofu,” Journal of the American Oil Chemists’ Society, vol. 58, no. 3, pp. 346-354, March 1981. N. W. Su, M. L. Wang, K. F. Kwok, and M. H. Lee, “Effects of temperature and sodium chloride concentration on the activities of proteases and amylases in soy sauce koji,” Journal of Agricultural and Food Chemistry, vol. 53, no. 5, pp. 1521-1525, February 2005. T. Yokotsuka, “Soy sauce biochemistry,” Advances in Food Research, vol. 30, pp. 195-329, 1986. J. S. Lee, S. J. Rho, Y. W. Kim, K. W. Lee, and H. G. Lee, “Evaluation of biological activities of the short-term fermented soybean extract,” Food Science and Biotechnology, vol. 22, no. 4, pp. 973-978, August 2013. Y. Zhu and J. Tramper, “Koji - where East meets West in fermentation,” Biotechnology Advances, vol. 31, no. 8, pp. 1448-1457, December 2013. F. M. Yong and B. J. B. Wood, “Microbiology and biochemistry of soy sauce fermentation,” Advances in Applied Microbiology, vol. 17, pp. 157-194, 1974. M. H. Kang, J. S. Kim, S. J. Park, and T.Shibamoto, “A study on biological and chemical changes in fermented soybeans, grown under organic vs non-organic conditions, during storage,” Journal of Agriculture and Biological Sciences, vol. 3, no. 2, pp. 278-286, March 2012. Official Methods of Analysis, 17th Ed., Maryland: Association of Official Analytical Chemists, 2000. Chinese National Standard (CNS), Taiwan, 2002. G. L. Miller, “Use of dinitrosalicylic acid reagent for determination of reducing sugar,” Analytical Chemistry, vol 31, no. 3, pp. 426-428, March 1959. C. C. Chou and M. Y. Ling, “Biochemical changes in soy sauce prepared with extruded and traditional raw materials,” Food Research International, vol. 31, no. 6-7, pp. 487-492, August 1998. L. F. Hamilton and S. G. Simpson, “Precipitation methods,” Quantitative Chemical Analysis, Macmillan, New York, 1964. R. Y. Cui, J. Zheng, C. D. Wu, and R. Q. Zhou, “Effect of different halophilic microbial fermentation patterns on the volatile compound profiles and sensory properties of sauce moromi,” European Food Research and Technology, vol. 239, no. 2, pp. 321-331, August 2014. Z. Y. Chen, Y. Z. Feng, C. Cui, H. F. Zhao, and M. M. Zhao, “Effects of koji-making with mixed strains on physicochemical and sensory properties of Chinese-type soy sauce,” Journal of the Science of Food and Agriculture, vol. 95, no. 10, pp. 2145-2154, August 2015. Y. Z. Yan, Y. L. Qian, F. D. Ji, J. Y. Chen, B. Z. Han, “Microbial composition during Chinese soy sauce koji-making based on culture dependent and independent methods,” Food Microbiology, vol. 34, no. 1, pp. 189-195, May 2013. J. Feng, X. B. Zhan, Z. Y. Zheng, D. Wang, L. M. Zhang, and C. C. Lin, “A two-step inoculation of Candida etchellsii to enhance soy sauce flavour and quality,” International Journal of Food Science and Technology, vol. 47, no. 10, pp. 2072-2078, October 2012. T. R. Chen and R. Y. Y. Chiou, “Microbial and compositional changes of inyu (black soybean sauce) broth during fermentation under various temperature conditions,” Journal of the Chinese Agricultural Chemical Society, vol. 34, no. 2, pp. 157-164, 1995. T. Y. Wu, M. S. Kan, L. F. Siow, and L. K. Palniandy, “Effect of temperature on moromi fermentation of soy sauce with intermittent aeration,” African Journal of Biotechnology, vol. 9, no. 5, pp. 702-706, 2010. C. Van Der Sluis, J. Tramper, and R. H. Wijffels, “Enhancing and accelerating flavour formation by salt-tolerant yeasts in Japanese soy-sauce processes,” Trends in Food Science and Technology, vol. 12, no. 9, pp. 322-327, September 2001. X. Gao, C. Cui, J. Ren, H. Zhao, Q. Zhao, and M. Zhao, “Changes in the chemical composition of traditional Chinese-type soy sauce at different stages of manufacture and its relation to taste,” International Journal of Food Science and Technology, vol. 46, no. 2, pp. 243-249, January 2011. X. Gao, P. Sun, J. Lu, and Z. Jin, “Characterization and formation mechanism of proteins in the secondary precipitate of soy sauce,” European Food Research and Technology, vol. 237, no. 4, pp. 647-654, October 2013. P. C. Chao, C. C. Hsu, and M. M. Yin, “Analysis of glycative products in sauces and sauce-treated foods,” Food Chemistry, vol. 113, no. 1, pp. 262-266, 2009. 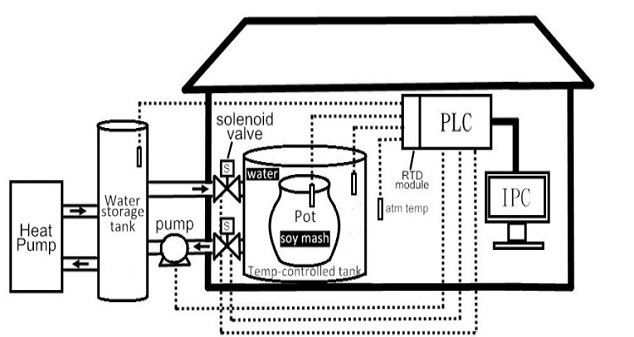 S. Ferng, “A Controlled Fermentation Environment for Producing Quality Soya Sauce”, AITI, vol. 4, no. 1, pp. 11-20, Jan. 2019.